Are the dropout rates in your school district too high? Try covering one of your school buses with this half school/half prisoner-transport bus vinyl wrap. If that doesn't scare them into reading Catch-22, nothing will. 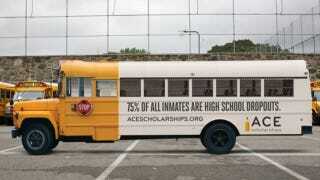 The bus was made by the ad agency TDA Boulder for Colorado's non-profit ACE Scholarships. They'll be taking this bus (on loan from a Denver school) around Colorado this summer to raise awareness as of well as funds for their partial tuition scholarships for low-income children.